Integrated support rails with a 500lb weight capacity. 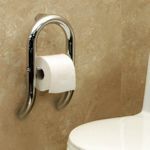 Professional grade construction and superior quality fittings ensure years of uncompromising support. Discreet wall stems with concealed screws. Meticulously designed wall interface stems render mounting areas virtually invisible. 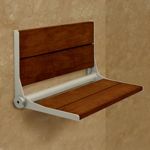 Multi-Contact wall support. While two-point contact with the wall structure is standard for most support rails sold in Canada, most Invisia products feature up to 4 points of contact for maximum structural support. 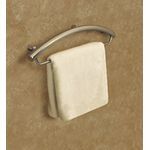 Either the elegant towel bar or accent ring is extremely helpful for getting out of deep bathtubs, and neither look like grab bars. Solid Surface. 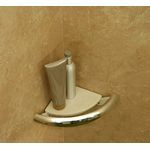 The soap dish, shampoo shelf and corner shelf feature beautiful, removable, shatterproof surfaces that resist the growth of mold and bacteria. 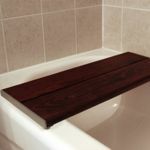 Solid, sustainable bamboo is used in the Serena Seat and Bath Bench to naturally resist mildew and decay. If you are building or renovating a home that you plan to retire in, consider this exquisite addition to your plans. 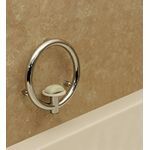 The Invisia Collection can add quality to your everyday living and value to your home.